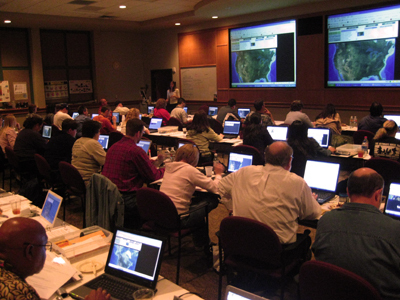 UNAVCO gave a teacher workshop on using Global Positioning System (GPS) data in the classroom in April 2008 as part of the TeXas Earth and Space Science Revolution (TXESS Revolution) teacher professional development program, which is being led by PI Kathy Ellins of the University of Texas, Austin. The TXESS Revolution is a five-year program for eighth grade and high school teachers working in minority or underserved public schools. It is designed to prepare educators for the new capstone course in Earth and Space science in Texas high schools. Earth Science was removed as a credit option for graduation in 1998 in Texas high schools, and then restored in 2006. The rigorous new capstone Earth and Space Science course will integrate concepts and information from many different fields. The challenge facing Texas is to ensure that there will be enough educators qualified to teach the new course by 2011 when it becomes an option to fulfill the science graduation requirements. 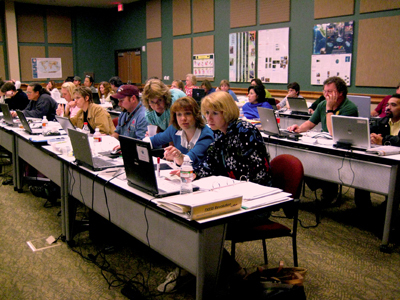 The TXESS Revolution program consists of eight three day professional development academies and two summer institutes that are intended to provide a solid foundation in geoscience to the educators who will teach Earth and Space Science. The TXESS Revolution welcomed UNAVCO involvement in the most recent professional development academy to provide teachers with data-focused activities to explore plate movement, crustal deformation, and isostatic adjustment. Next spring UNAVCO will once again support the TXESS Revolution by integrating activities based on the POLENET project into a professional development academy on extreme environments and events. UNAVCO Education and Outreach offers workshops aimed at middle and high school educators on using real data to illustrate geological phenomena, such as crustal deformation related to tectonic motion, earthquakes, and volcanoes. Our workshops include lecture presentations on the background of GPS and science topics studied through the application of GPS, the development of the theory of plate tectonics, and the EarthScope project. Our instructors lead a series of computer-based, hands on, and kinesthetic exercises using the GPS data, accommodating the variety of learning styles that exist in a classroom and provide plenty of time for questions and discussions. The E&O team at UNAVCO has developed several user-friendly interfaces to access processed GPS data. Activities can include learning how to use Jules Vern Voyager Jr., a data exploration tool that allows you to plot layers of datasets, including plate motion vectors, earthquake focal mechanisms, volcano locations, plate boundaries, and more. We also give a tour of our Data for Educators Portal, which highlights GPS stations that show a particular geologic phenomenon, such as plate rebound after an earthquake, strike-slip and subduction zone motion, and ground motion due to volcanic activity. Through hands-on activities, participants learn how to read GPS time series plots, how to plot velocity vectors for individual stations, and how interpret the data to predict regional plate motions. As a final group activity, we discuss how the crust is moving at specific areas around the world. All of our educational workshop materials are available on our website, so even if you can’t make it to one our workshops we invite you to explore our E&O site. Upcoming workshops and links to past workshop materials can be found at the UNAVCO Educational Workshops. Also browse Data for Educators and Map Tools. The TXESS Revolution is bringing rigorous geoscience training to Texas teachers who teach minority students in underserved schools. The program has the potential to impact many students and to expose them to the excitement of the geosciences. Some will go on to higher degrees as a result of the capstone course and the encouragement of enthusiastic, well-prepared Earth and Space Science teachers. UNAVCO is glad to be able to play a small part in inspiring young students to pursue the geosciences. The TXESS Revolution is supported by a grant from the National Science Foundation, with additional funds from the Jackson School of Geosciences, and the Texas Regional Collaborative for Excellence in Science and Mathematics Teaching (Shell Oil grant). Figure 1 - UNAVCO’s Education and Outreach specialist Jayme Margolin teaches about what earthquakes and volcanoes tell us about plate tectonics. Figure 2 - Participants explore UNAVCO’s Jules Verne Voyager junior online mapping tool. 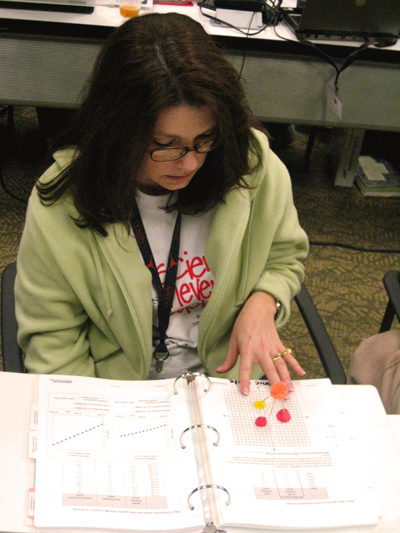 Figure 3 - A participant uses her gumdrop GPS to explore tectonic plate motions. 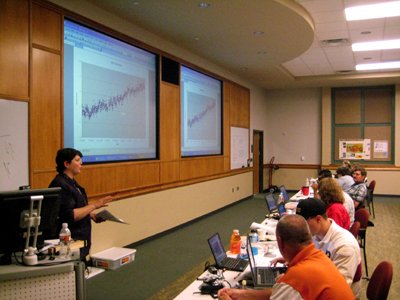 Figure 4 - UNAVCO’s Education and Outreach Specialist Shelley Olds shows the audience how to read GPS time series plots.